The ATO has warned of ongoing scam emails, SMS messages or telephone calls in which criminals try to steal money or information from taxpayers. 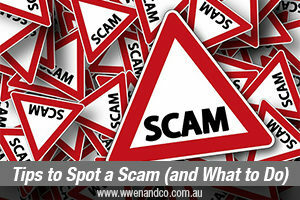 These scam communications can be very convincing and many people become scam victims every year. To avoid becoming a victim, it is important that you know some of the common characteristics of a scam so that you can be on the lookout for potential scammers and prevent their fraudulent actions. Are pushy and can be intimidating, threatening arrests or penalties if you do not pay an unknown tax debt immediately. Demand payment in full and in some cases via unconventional methods such as iTunes cards, cash transfers or gift vouchers. Ask you for your personal or financial information or to confirm information they pretend they have. Can often be poorly worded, and (for written scams) could contain spelling and grammatical errors. May promise you a tax refund in exchange for a payment or personal information. Could contain an attachment or fake links asking you to lodge a form. Opening these attachments or links may cause you to download spyware or a virus. If a scammer or someone claiming to be from the ATO has contacted you and you are unsure if they are genuine, then you want to notify the ATO. Call the ATO’s dedicated scam reporting line on 1800 008 540 between 8:00 am and 6:00 pm EST, Monday to Friday. Avoid clicking on links or opening attachments. And of course, please feel free to check with the chartered accountants and tax advisers at our Epping Office if you have any doubts or concerns about communications supposedly from the ATO.